Is it possible to modify the ROM for the Satelleview game Special Tee Shot [filename: "BS Special Tee Shot (J).smc", headerless, CRC: 841C8EB9] to work on Canoe like what has been done for "Golf Daisuki! : O.B. Club"? Based on reading a bunch of things I think that monkeying around with some of the SNES header (not the SMC header) might do the trick, but I would have no idea how to actually do that successfully. On the plus side, the game is already 100% in English to begin with, so no game translation would be needed. Did you ever figure out how to do this? I found these tips re. headers, but couldn't find the right spots in a hex editor. I did manage to get Special Tee Shot working through SNEX9x 16 through Retroarch, using the BSX bios. But a Canoe fix would be great. No, I never got it to work. I tried to hack the headers using some guides, but even after a lot of effort it really didn't work quite right. 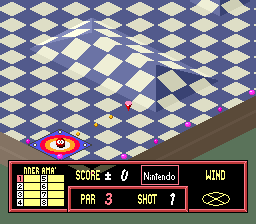 The menu would get all glitchy, and the intro screens for each hole would always have garbled text (see below). Saving was also problematic. Whatever the problem is, it's not something that someone like me with no actual expertise could pull off, as even some reproductions sold in Japan have the same problem. 1) The course selection menu screen glitches out badly if you attempt to select a course using the D-pad (unless you simply press "A" for the default Beginner Course). 2) The hole overview screen still has the glitchy text that I linked a picture of previously. 3) Other elements of UI are corrupt as seen in the picture below (e.g. the word "BEGINNER" in the scoring box in the bottom left is replaced with "NNER AMA"). Since "AMATEUR" is the next course / difficulty level, it's almost if the pointer was misdirected by a couple bytes or something? 4) The game soft-locks after completing a course and displaying your final score. 5) The game won't save your progress upon completing a course, making it impossible to play any of the 8 other courses that are unlocked in sequence. EDIT: Another poster made a conversion of a different Satellaview game (DynamiTracer) and posted his source code for doing so, perhaps that might help? The only obvious difference between Special Tee Shot and DynamiTracer is that Special Tee Shot is a LoRom game while DynamiTracer is a HiRom game if that makes a difference. The thing is that I have zero assembly knowledge, though. Hi i have discovered Gon has the overscan problem when you press reset and resume the game or load a savestate, can some one fix it please?? I believe the same overscan problem after going to the menu and returning happens for Yoshi's Cookie. Mega Man 3 Improvement hack: stage select screen fixed for kachikachi. Enjoy! (this is my first hack, hope it works fine). Hello, Megaman x2/Rockmam x2 has a problem. when in "magna centipede" stage the search lights is dark yellow looking color. should be a brighter yellow. And megaman x3/rockman x3 has the same problem. But you can see it when you try to use the "ride armor'. this can be seen in stages that have the ride armor summoner thing.